Always put your student's best interests first. Think about what she really needs, long-term, and find creative ways to serve those needs. Imagine yourself in his or her shoes. Remember the old expression "teach a man to fish..."? Revision: teach a student how to learn, and he will be able to teach himself for a lifetime. For example, if a student says he can't do a long-division problem, start by coaching him on gathering information from his book or notes, then help him apply this information to the problem. He'll be more successful next time he's alone with his math homework. You can't serve a student by doing her work for her. It's a short-term solution to a long-term problem. Ask the student to explain the problem to you, then keep asking questions. Example: If a student needs help proofreading, first teach a proofreading strategy, then guide her in applying that strategy to her own work. This piece of tutoring advice is crucial, because if you do your student's work, even a little, you send the signal that he or she can't do it. You could do more harm than good. 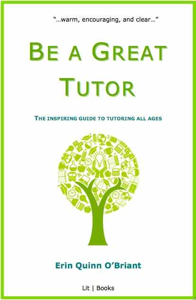 The great advantage of tutoring over classroom teaching is your ability to make the material interesting and relevant for that particular student. Find out what her interests are and then use them to shape your lessons. If you've got a student who loves video games and is failing English, find a way to connect the heroes of the game to those of Homer, or have the student write about the game. It'll be fun and productive for both of you. Let your student know that you were once a student, too. It's okay to share that you have struggled sometimes, too. Share an appropriate example from your own experience of learning. If you encounter a stumbling block during a session, lead by showing the student how to overcome it. Example: You might say, "I don't know that word, either. When that happens, I get out my dictionary and look it up. Let's do it together."